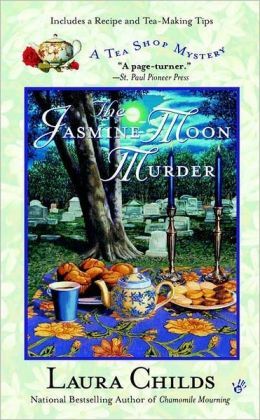 Synopsis (from bn.com): Theodosia Browning, proprietor of the Indigo Tea Shop, and her staff are serving tea and goodies during the first-ever “Ghost Crawl in Charleston’s famed Jasmine Cemetery.” The event ends abruptly when Dr. Jasper Davis, uncle of Theo’s beau, Jory, dies mysteriously and publicly. Det. Burt Tidwell makes Theo promise she won’t stick her amateur nose in, but a frazzled Jory pleads with her to use her special abilities as a sleuth to root out the killer. The victim was vice-president in charge of research at a large medical products company, Cardiotech, and Theo suspects Dr. Davis’s death is connected with his job. A second murder complicates things, but Theo perseveres and eventually corners the killer using a snazzy bit of up-to-date technology to summon help. My thoughts: I am making my way through the great Tea Shop Mystery cozy series over time in between reading a myriad of other books in between (you readers know the challenge of trying to read everything you want to read . . . ahhhhhhh), ok I’m back 🙂 This fifth book in the series surely did not disappoint. Theo and her fabulous cast of characters was back at their favorite sleuthing skills again. There is no doubt, I will be returning to Charleston for #6 in the series . . . and many, many more. A great, fun, charming cozy series. I highly recommend. Synopsis (from bn.com): The ladies of the Cackleberry Club are always ready to serve—whether they’re cooking up breakfast or sniffing out a bad egg. and at least one of them was worth killing for. My thoughts: The Cackleberry Club has got to be in my top 5 of my favorite cozy locations in all of the cozy series! Come on . . . a café specializing in eggs, a book nook, and a knitting corner all in one location . . . it doesn’t get much better than that. Now if I could just make some of these cozy locations truly come to life and go there . . . oh well, a cozy reader can dream. I truly enjoy this cozy series. The main characters and owners of the Cackleberry Club, Petra, Suzanne, and Toni, are just great. They are each different in their personalities and when put together make for a great mix of characters. I must say that as the series continues, Toni’s “husband” Junior, has to go . . . it is time, he treats her like dirt and has no relevance to the stories. As much as I love this series, I will admit that I was a bit disappointed by the ending of this one. To me at least, the killer came completely out of nowhere. I don’t want to give anything away for those who haven’t read it, but the killer played such a minor role in the story that I had to look back to even see who this character was. Not good! Overall, a great, fun cozy series set in a great location. Synopsis (from bn.com): It is a truly exhilarating experience for Indigo Tea Shop owner Theodosia Browning-helping Charleston’s Sea Turtle Protection League shepherd hundreds of tiny green loggerheads safely into the sea. But just as she’s about to celebrate all her hard work, she spots a dead body bobbing in the waves. Now it’s up to Theo to get to the bottom of the murder before the culprit’s greed stirs him to kill again. This is always definitely the case with my friends at Indigo Tea Shop in this great Tea Shop series . . . love Theodosia and particularly Drayton! Now this being said, the overall plot of this particular book fell a bit flat for me, overall the book was good, the storyline just felt a little boring to me. I am sure it was just the topic and will not hinder my desire to read this entire series! I look forward to what my friends at Indigo Tea Shop will get into next. A great cozy mystery with great characters! All in all, I really am enjoying this series. I still am trying to find a good tea tasting in my area as the ever loving Drayton in this series is just spurring me on to go to one! A lovely cozy series with fun characters and great education about tea! My thoughts: I picked up this Tea Shop Mystery Series completely by fluke over the Christmas season. I planned on just reading one here and there in between some of my other reads (off of my huge To Be Read pile – oh you readers, know what I am talking about, don’t deny it, you have one too :)), but I know find that I am really enjoying the series. Gunpowder Green marks the 2nd book in the series. Theodosia, owner of the quaint Indigo Tea Shop in Charleston, South Carolina, returns with her wonderful cast of characters including Haley, Drayton, and many others. I really enjoy the characters in this series. They are warm, welcoming, and hilarious at times. I recommend this series if you are looking for a quick mystery read and along the way, you may learn quite a bit about tea as well! On to #3, “Shades of Earl Grey”! Synopsis (from book cover): Meet Theodosia Browning, owner of Charleston’s beloved Indigo Tea Shop. Patrons love her blend of delicious tea tastings and Southern hospitality. And Theo enjoys the full-bodied flovor of a town steeped in history and mystery . . .
My thoughts: In Death by Darjeeling, the first installment of Laura Child’s bestselling Tea Mystery Series, we meet Theoedosia Browning, owner of the quaint Indigo Tea Shop. This is an older cozy mystery series, that I have finally gotten around to working my way through – and I am certainly glad that I did. I really enjoyed this book. The characters were wonderful, the setting very inviting, and I want to read more, which is always good! I, myself, am not a huge tea drinker, but this series has really piqued my interest in the whole world of tea. Even though it is a simply, fun mystery, it really educated me quite a bit about the tea world – where it is grown, how to properly steep the tea, different kinds of tea. It has made me want to find a great Tea Tasting in my community. Overall, a fun read in a great series! I have already started book #2 “Gunpowder Green”.